Carpenters often are not keen on angles nor drawers, as both require great precision, which can be difficult to achieve on site. With the help of the Information Center on diywardrobes.co.uk Jason set out designing the built-in cabinets himself and the well turned out result can be seen below. 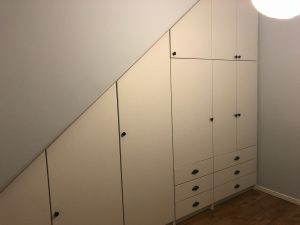 These built-in cabinets for his basement bedroom vary in individually sized units providing shelving, hanging spaces as well as drawer spaces, just as Jason had been looking for.